Do You Remember... "Wild Wild West". Walt Disney’s 30 minute adventures of Johnston McCulley’s “Zorro” premiered October 10, 1957, on ABC, sponsored by 7-Up and AC Spark Plugs. It was seen on Thursday night from 8-8:30 EST for 78 black and white half hour episodes through July 2, 1959. Four additional hour long segments were seen on “Walt Disney Presents”, two in ‘60, two in ‘61. 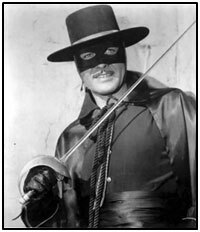 Zorro, which is Spanish for fox, was Don Diego de la Vega (Guy Williams) the son of wealthy landowner Don Alejandro de la Vega (George J. Lewis). Don Diego returns from his studies in Spain to find Los Angeles under the command of Capitan Monastario (Britt Lomond) who is using his power for personal gain. Concealing his ability with a sword, Don Diego affects the demeanor of a milquetoast intellectual meanwhile adopting the secret identity of Zorro to fight Monastario’s injustice. Throughout his exploits Diego could always count on the assistance of his faithful mute manservant Bernardo (Gene Sheldon) (left) who pretended to be deaf as well, allowing him to secretly listen in on conversations and report back to Zorro. Another important character was Sergeant Garcia (Henry Calvin), the second in command of the pueblo. Fat, superstitious and overly fond of food and drink, Garcia was a comedic character nevertheless faithful to his sinister commanders. Under Sgt. Garcia was Don Diamond as Corporal Reyes. For the majority of its two season run Zorro’s adventures were broken down into continuing story arcs. The first of these chronicles Don Diego’s arrival and his battles as Zorro with the cruel Commandante Monasterio. The second storyline found Zorro uncovering the machinations of the evil Magistrado Carlos Galindo (Vinton Hayworth) who is part of a plot to rule California. The third, and best remembered, story arc concerns the leader of that conspiracy, the shadowy figure of The Eagle, eventually revealed as vain Jose Sebastian Vargas (Charles Korvin). Despite excellent ratings, the series ended after two seasons due to a bitter dispute between Disney and ABC over ownership of “Zorro” and “The Mickey Mouse Club”. The legal battles resulted in four hour-long episodes of “Zorro” which were aired in ‘60 and ‘61 on “Walt Disney Presents”. But, being broadcast with months in between, the interest in the character wained. At its peak, Zorro merchandising was everywhere and the themesong, first recorded by The Mellowmen, was a hit for The Chordettes on Cadence Records, peaking at #17 on the national BILLBOARD charts. Incidentally, the part of Don Diego often called for Guy Williams to play the guitar and serenade senoritas. Unfortunately, Williams could do neither so his singing voice was dubbed by Bill Lee of The Mellowmen. 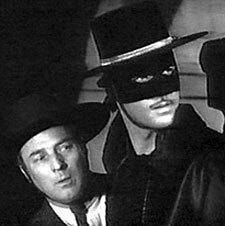 Zorro later returned to TV in syndication beginning with the ‘65-‘66 season. Primary directors on the series included Norman Foster, Charles Barton, Hollingsworth Morse, Harmon Jones and Bill Witney (who upped the action content in season two). Guest stars over 82 episodes include such renowned western players as John Dehner, Jack Elam, Charles Stevens, John Doucette, Henry Wills, Jim Bannon, George Keymas, Rudolfo Acosta, Suzanne Lloyd, Michael Pate, Ted DeCorsia, Kent Taylor, Jay Novello, Lee Van Cleef, BarBara Luna, John Litel, Jean Willes, Yvette Dugay, Harold J. Stone, Cesar Romero, Gilbert Roland, Robert Vaughn, Richard Devon, Jeff York, Gloria Talbott, Bob Wilke, Joan Evans, Paul Richards, Douglas Kennedy and Ricardo Montalban—just to name a few. 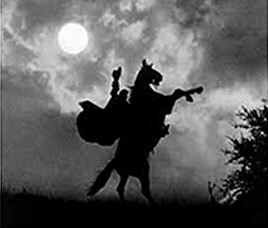 56 years after Zorro first rode onto TV screens to oppose injustice, he continues to attract new fans who still make the sign of the Z.